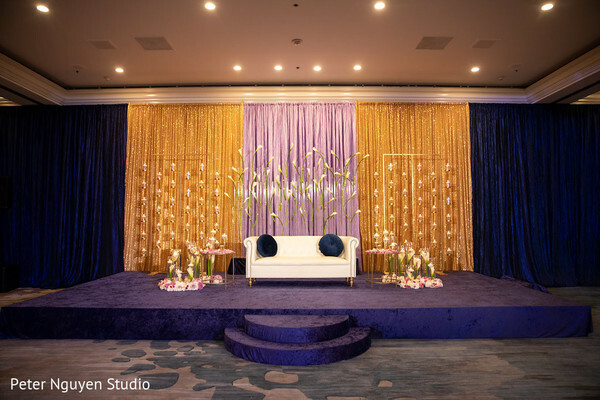 Peter Nguyen Studio gives us a peak of his photographic skills and talents and takes us back to the Renaissance Newport Beach to witness the grand celebration of Monica and Naren’s nuptials! 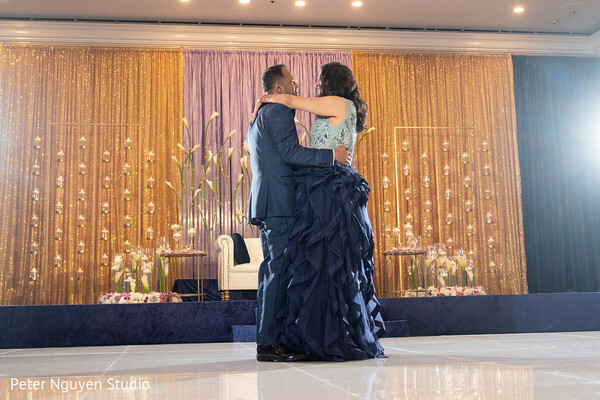 It was time to celebrate and the beloved newlyweds turned heads as they made their big entry and had a romantic first dance looking mighty regal! 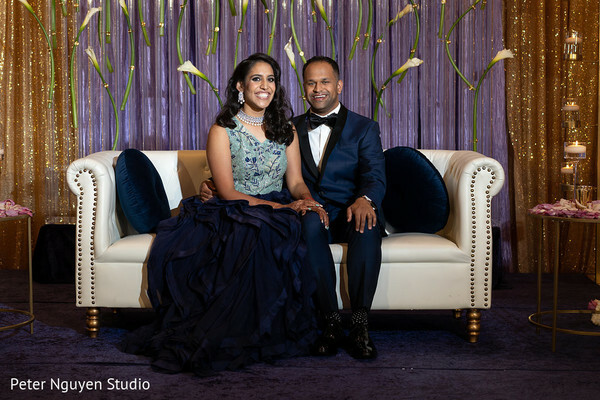 Our showstopping bride, Monica went for a dazzling Shyamal & Bhumika design that allowed her to show off her intricate mehndi design from Dream merchants while dapper Nareen was effortlessly elegant in a sharp blue tuxedo! 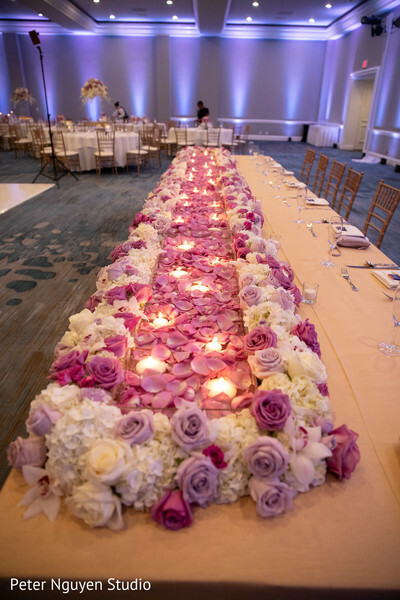 The wedding stage was decked out by Ethnic Essence Couture Events with a unique combination of shiny backdrops, candle lights and they embellished every last table top with tall floral centerpieces. 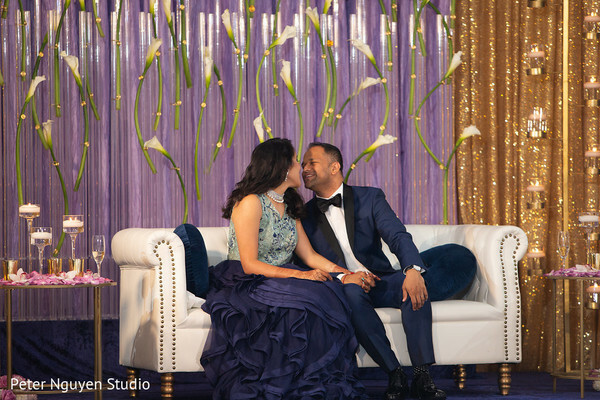 Shilpa Patel Events ensured every detail was in place so these two had the time of their lives! 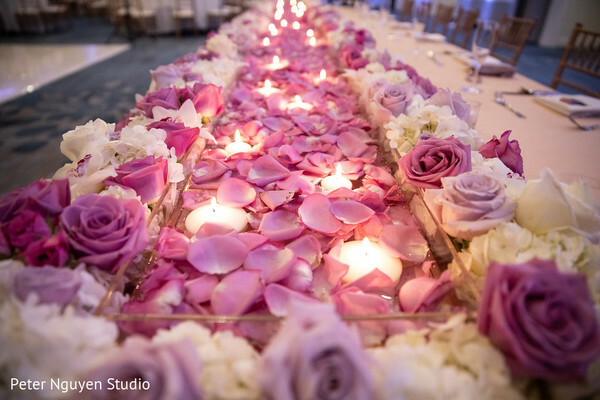 Fill your heart with some serious inspiration by visiting our full gallery! We met back on Thanksgiving 2012, when I studied for 3 months in D.C for undergrad. This was the first time I was meeting the Sridhar's. The parents had a hidden agenda for the evening, which included setting up my older sister with Naren's older brother. Safe to say, that didn't work out. 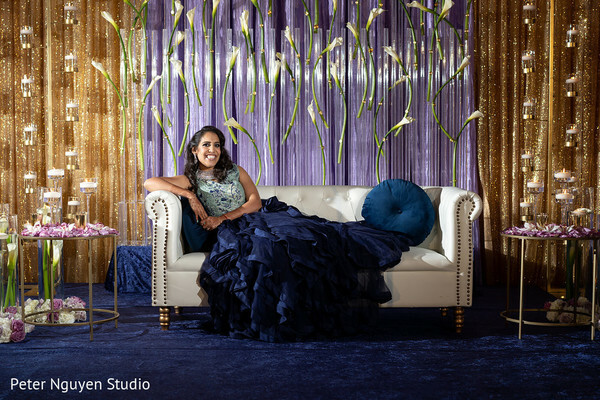 I instantly felt a spark upon meeting Naren, but was dating someone else at the time. The evening and weekend were filled with a ton of local beer, home-cooked food, and sightseeing in D.C.
A month later, I was in San Francisco and ended up having a tourist day with Naren and his brother. This is the weekend where the true magic happened. After a trip to a local speakeasy, I made the first move and grabbed Naren's hand while crossing the busy streets of San Francisco. That's when we knew that the feelings were mutual. After a congenial couple of emails between family friends, we slowly started texting every day. We stayed up for hours on end, sending silly pictures and emojis to each other. We got to know each other better, virtually, over the next few months. In my last year of college, I went through a terrible roommate situation, and Naren ended up being there, by phone, through it all – whether it was to listen to me vent or to make me laugh. Later in June 2013, Naren was in Southern CA for his best friends wedding and asked me to accompany him to the wedding, as friends. We took silly photo booth pictures, danced the night away to Spice Girls, and had an amazing time together. We eventually went outside to catch the Disneyland firework show, for which we missed it since they were on the wrong side of the building. We ended up talking outside for some time, at which time Naren asked me out. In my mind, I always felt like Naren was the one for me. We have similar interests, are comfortable enough to be a little quirky, and even with the distance, every time we got to see each other, it didn't feel like we were starting anew. In April 2017, Naren started actively shopping for an engagement ring. He already knew what shape the ring was going to be, from a text of a bus advertisement he received a few months prior. In July 2017, he had finally found the perfect ring, while shopping with his mom and brother, Navin, in Seattle. 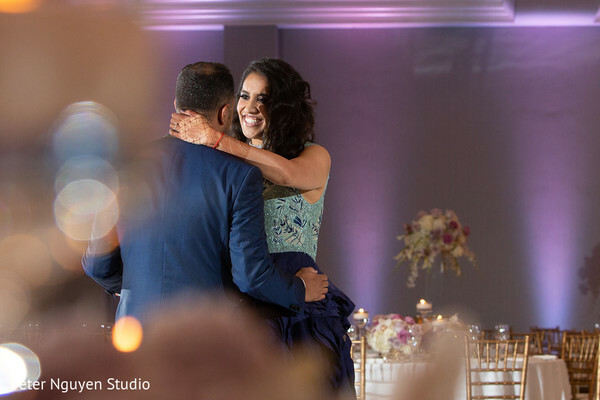 Naren had thought about proposing at various points throughout July & August 2017, but none of them seemed like the perfect moment. Due to the fact that I'm really into food, Naren knew the perfect location to propose would be one of my favorite local restaurants - on a totally random Wednesday night! It was just like another weeknight, Naren's dad was making a surprise trip to Seattle for work and wanted to have dinner with us. Little did I know, that was all a setup and a perfect one at that. We got seated at the best seat in the house, the Chef's table. Shortly after being seated, Naren purposefully left his wallet in the car, so he could sneak away from the table to go retrieve it. Eventually, Naren came back to the restaurant while finishing up a call with his dad on the phone. Naren abruptly walks into the restaurant, and says, "Sorry. My dad isn't coming to the restaurant", at which point I gave him a very concerned look on my face. At that point, I knew this was all staged! The planning of our dream wedding was such a group effort! We had a WhatsApp group called "Team Narmony" where we discussed everything from what we were going to wear, to vendors, to who is staying in which hotel. There were many nights of family conference calls as well - which was a challenge when dealing with people in different time zones. My mom was crucial in tapping into her network to secure the most amazing hair & makeup artists, outfits, decorator, and photographer/videographer. Both of our families worked so hard to make this the wedding we always wanted, while also making it an effortless experience for friends and family. I wouldn't trade this experience for anything! We had our Big Day in Southern California but currently live in Seattle, WA. Seattle holds a special place in my heart and I have so many vendors and restaurants I love in this city. 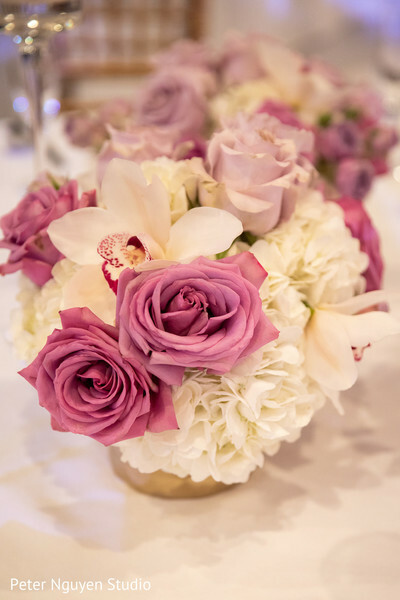 I loved finding unique ways to incorporate this wonderful city into my SoCal wedding. 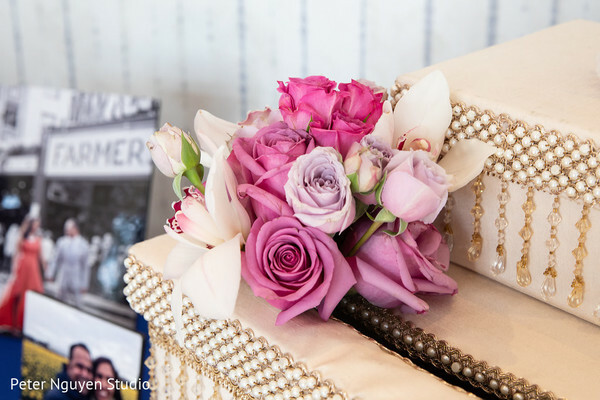 Some examples of how I incorporated were: bridal robes, Welcome sign, Reception Guest Book, Table Numbers, and Reception Party Favors. I even had the Seattle skyline drawn into my bridal henna. My first look with my now-husband was so special, but the one that I constantly look back at is the first look with my dad. I was wearing my paternal grandmother's wedding jewelry and was decked out in a traditional Paithani (Marathi) sari. We did our first look on a secluded balcony of the hotel, and the moment my dad turned around, we both starting tearing up. I'll never forget the way my dad looked at me, so proudly and admiration. My dad and I haven't lived in the same house for over 10 years, but I've always been very close to my dad. It was just the feeling of daddy's little girl really growing up and moving on. It really hit me at that point that I was getting married, but I knew that my dad was always going to be the first man I loved. For the reception, we didn't have a wedding party and didn't do the traditional entrance with bride and grooms, mom and dad. We changed it up and allowed the mom's, dad's, and sibling to enter together. Each pair could pick their own song, which led to some fun entrances and music choices. To us, it really portrayed the melding of our families. You have got to get through it! There will be disagreements, tears, and so much more - but I promise you it is so worth it in the end! We didn't have a cake at our wedding. We instead did freshly baked cookies from a local Orange County company and had some delicious Indian ice cream from Saffron Spot. The dinner was so decadent, that it was nice to have something simple for dessert. 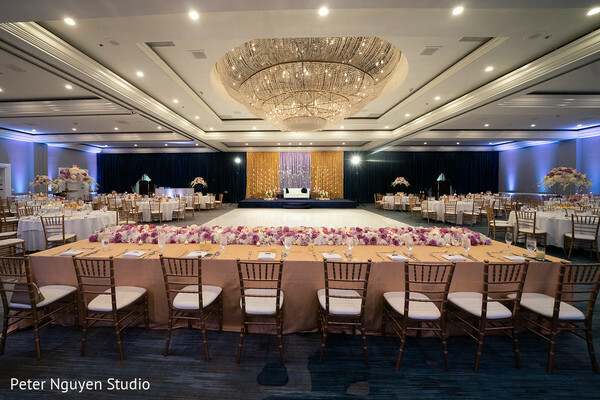 Ethnic Essence Couture Events and Peter Nguyen Studio are members of the Platinum Guide. Love what you see? Explore their portfolios.